Villa Pereybere 3 promises luxury and comfort as you bask in the glorious warmth of the tropical sun. Close to a plethora of amenities, this charming villa is ideal for group holidays, with your friends or family. Overlooking the turquoise ocean, the villa can accommodate up to 8 people, guaranteeing endless hours of fun. Offering a scenic panorama of the lush emerald greenery that helped make Mauritius one of the most sought-after tourist destinations. 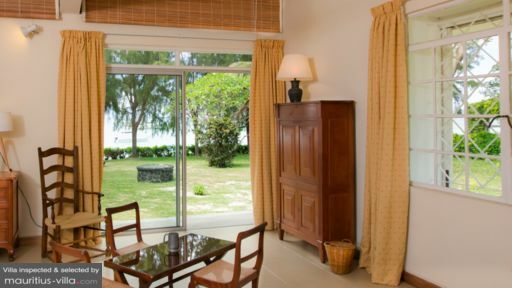 At Villa Pereybere 3, guests can also benefit from regular gardening services, as well as daily housekeeping to take care of any mess and clutter. For an additional fee, it is also possible to rent an in-house cook who will be happy to whip up just about anything you want to eat or help you discover some local delicacies. To help you beat the tropical heat, each of the four bedrooms is equipped with an air-conditioning system. The four bedrooms are designed to sleep a total of 8 people. The master bedroom contains a safe, a queen-sized bed along with an en-suite bathroom, complete with shower and toilet. The two other bedrooms include double beds and air-cons while the last bedroom has a single bed, as well as an air-conditioning system. 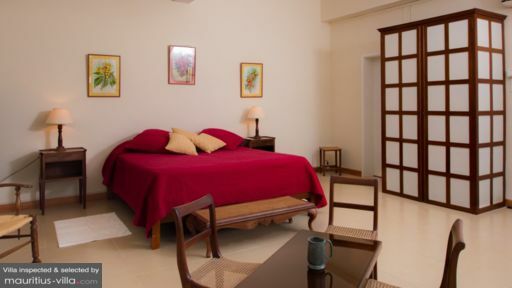 The guest bedrooms all share a spacious and fully-equipped bathroom. Villa Pereybere 3 is equipped with a spacious outdoors area where you can just lie back and relax as you enjoy the balmy island breeze. In fact, it even includes a massive salt water pool in which you can enjoy a refreshing dip after a full day of exploration. Best of all, the villa also comes with a gazebo and barbecue facilities that guarantees delicious Al-Fresco dining, night after night. Several lounge chairs have also been included in the tropical garden, where you can lounge back and relax with a good book and a cold drink. The garden additionally comes a variety of outdoors wicker furniture. Best of all, the villa offers a glorious view of the quintessential stretch of white sandy beach and turquoise lagoon that’s always sparkling under the island sun. The living areas at Villa Pereybere 3 are exquisitely comfortable, offering you the perfect haven of relaxation after a day filled with fun and adventures. The kitchen, for example, is filled with just about anything you might need to prepare your own meals. From a dishwasher to the stove, microwave, fridge and utensils of various kinds, you can be sure to benefit from all the amenities you might require. In the open-plan living areas, you will find an airy and spacious living room, with a comfortable couch and flat-screen plasma TV. A dining area overlooks the veranda, providing you with wonderful views of the tropical garden as you dine. Patio furniture can also be found on the veranda, where you can enjoy a nightcap after dinner. 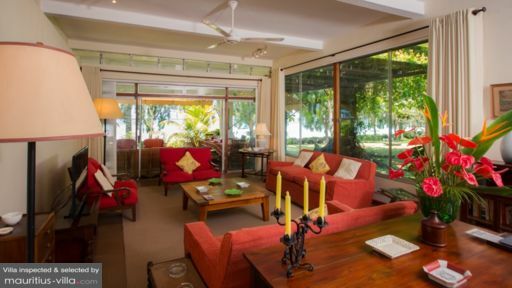 Villa Pereybere 3 is aptly located near some of Mauritius’ most coveted tourist areas. For example, a half hour drive away from the villa is found the world-famous Canonnier Beachcomber Golf Resort & Spa, where you can spend wonderful days under the sun as you work on your swing. This villa is also a short drive away from the tourist hub of Grand Bay, a town which is reputed for its lavish malls, nightclubs as well as Asian and Fusion restaurants. If you want to enjoy some shopping, grab a bus or a taxi which will take you to the Port Louis, the island’s capital, which is teeming with markets, fairs as well as high-end luxury stores. Villa Pereybere 3 was a superb location for our Mauritian family vacation. The ability to walk off the patio into the backyard and the beach was superb. The staff was outstanding! We had coconut juice from coconuts that grew within the palm trees on the property. We had an amazing stay. The villa was authentic with a breathtaking view but the stay was at the top thanks to Brinda and Fifi ... their good mood their sense of welcome, the delicious meals we enjoyed ... Thanks to you for all these moments to share together that will remain engraved ... and we hope to see you again next year.